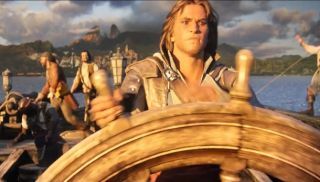 If anyone needed proof that Assassin's Creed III's naval battles were the best thing about that game , look no further than the two Assassin's Creed IV trailers Ubisoft showed off during its E3 presentation. The first one, while 100 percent CG, shows Edward Kenway doing what pirate captains do best—instigating bar fights with the nod of the head. Along with that are examples of how to knock someone out with what we assume to be booze, boarding enemy vessels, and assassinating with the rarely used steering wheel weapon. The second trailer opts for a catchy song and actual gameplay footage. It's not a live demo, but we'll take our gameplay footage of sea-plundering where we can. Hopefully Ubisoft has learned from the mistakes it made with Assassin's Creed III. More sea battles and less hunting sequences are good signs to me, but there's still a lot we don't know about Black Flag. You can read our preview of the game to catch up on what we do know , and we'll let you know how plundering in Black Flag works out when the game releases on October 29.